The Rhinoceros—what a name, and what an animal! The name comes from two Greek words: ρίς/ρίνος (rhis/rhinos) meaning ‘nose’ and κέρας (keras) meaning ‘horn’. With their horns and their imposing size, rhinos are a sight to behold. Weighing around 3,600 kg (8,000 lb)1, the rhinoceros is the second largest land animal after the elephant—with the hippopotamus third. 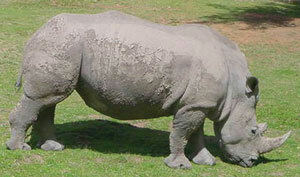 African rhinos look smooth-skinned, while in Asian species the skin hangs down in heavy folds. This is so pronounced in the Indian rhinoceros that the plate-like folds give the appearance of armour. What’s more, the skin is covered with tubercles, hard lumps that superficially look like rivets in the ‘armour’. Rhinos use their horns for sparring with each other, digging for edible plants, and for defense (all rhinos are vegetarian). Indian and Javan rhinos have a single horn; the Sumatran (or hairy) rhino, and the African white and black rhinos have two. But unlike the ‘true horns’ of cattle and goats, which have a core of bone and are attached to the skeletal structure, rhino horn is made of densely-packed keratin fibres—the same substance as our fingernails and hair. Rhinos are said to have poor eyesight, but an excellent sense of smell. Their ears can swivel independently of each other and can pick up the faintest sounds from any direction. Their three-toed feet are large (which helps to spread the load they carry), and leave a characteristic three-lobed footprint much like an ace of clubs. As in other heavyweight mammals like elephants and hippos, rhinoceros legs are almost straight—the ideal anatomy to prevent buckling when the animal is standing. Probably the biggest threat to the rhino is poaching for its horn. Traditionally, processed rhino horn has been believed to cure a range of maladies. 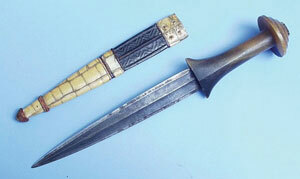 However, today’s demand is largely from Arab buyers in Yemen wanting rhino horn for elaborately-carved dagger handles—a symbol of status and wealth in that country. The rhinoceros is routinely described as a ‘prehistoric’ beast that has inhabited the earth for ‘millions of years’. But such language presumes evolution is true,4 and that rhinos are descendants of the first mammals to have evolved hooves (such as cattle and sheep). Evolutionists say that the horse and the tapir are the rhino’s closest relatives—all are assigned to the perissodactyls, or ‘odd-toed ungulates’ (ungulate means ‘hoofed animal’). Evolutionists believe that perissodactyls preceded the artiodactyls, the ‘even-toed ungulates’, which include animals as diverse as the deer, pig, camel and hippopotamus. If evolution were true, one would expect to find numerous transitional forms in the fossil record, linking the presumed common ancestor to all these animals. But where are they? Such con­jecture—and that is what evolution is—does not bear up under scrutiny. Evolutionists themselves warn of the lack of evidence for evolution of the horse—supposedly a close relative of the rhino, and long paraded as a textbook ‘proof’ of evolution—in the words of one leading evolutionist, the textbook story is ‘lamentable’,5 and the previous 50 species have been reduced to two.6,7 And what of the rhino’s unique ‘horn’—it is not the bony structure of its supposed cattle and antelope relatives, but is made essentially of tightly wound hair. To say that these diverse life forms have evolved from a common ancestor is basically a statement of faith, not reality. So if rhinos aren’t the result of evolution, where did they come from? 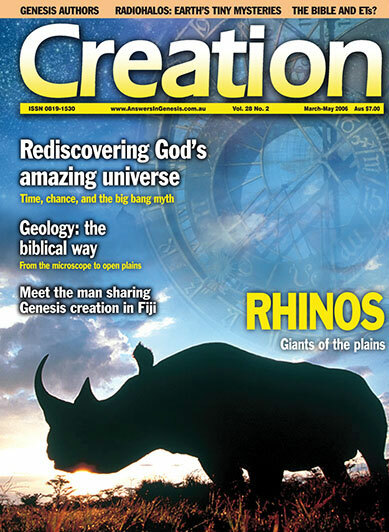 If one starts from the standpoint that the Bible is a reliable historical record and worldview, then things ‘rhino’ begin to make sense—when viewed through the biblical framework of Creation, the Flood and man’s position in God’s order. On two-horned rhinos, it is the front (anterior) horn which is longer. 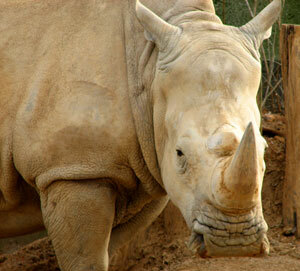 The biggest horn on record, from a female white rhino in South Africa, measured 158 cm (over 5 ft). Accepting the Bible’s account of history helps us to understand our world. Thus equipped, the notion that the rhinoceros (or indeed, anything else) could have evolved is indeed preposterous. 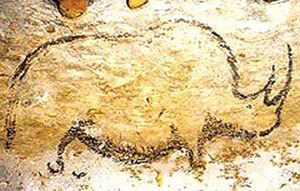 Ancient cave paintings in France depict woolly mammoths, bison, lions, horses and this woolly rhino. Standard evolutionary thinking ascribes these paintings to ‘primitive Stone Age’ individuals who are somehow mentally inferior to modern man. Rather, the evidence indicates great artistic ability, so there is no reason to believe that anyone other than people just like us created these animal paintings. Man has been intelligent from the very beginning. The extinct Teleoceras was a much smaller rhino, standing only about one metre (3–4 ft) tall and weighing about 140 kg (300 lb).2 It had a build similar to that of a hippopotamus, and also probably spent much time in water. Large numbers of Teleoceras were catastrophically buried in the Ashfall deposits of Nebraska, leaving well preserved skeletons. They are so plentiful that the main section of Ashfall is nicknamed ‘Rhino Barn’. And the largest land mammal fossil to have ever been discovered was quite possibly an extinct type of rhino—Indricother­ium (also known as Baluchitherium and Paraceratherium). Its remains have been found in central and south Asia;3 it looked something like a short-necked, hornless giraffe. It had a massive body—weighing up to an estimated 33 tonnes4 and standing 5.5 metres (18 ft) at the shoulder.3 It would easily have dwarfed even an adult bull elephant today. Woolly rhino, International Rhino Foundation, www.rhinos-irf.org/education/rhinofactsfiles/rhinofacts/extinctrhinos/woolly/, 18 May 2005. Prehistoric life, SOS Rhino, www.sos rhino.org/news/rhinonews070303b.php, 18 May 2005. Indricotherium, www.paleocraft.com/Indricotherium2.html, 18 May 2005. Peters, D., Giants, Alfred A. Knopf, Inc., New York, p. 10, 1986. See Sarfati, J., Mammoth—riddle of the Ice Age, Creation 22(2):10–15, 2000. Reconstructions from fossils of the ‘giant unicorn’ Elasmotherium sibiricus show it was a rhino­ceros two metres high (over six ft) and six metres long, with a single two-metre-long horn growing from its forehead.1,2 The fossils were found in Pleistocene strata, which evolutionists date from to 2,500,000 years to 10,000 years ago. So on that basis, they say that Elas­mother­ium has been extinct at least 10,000 years. When animals that evolutionists say have been long extinct turn out to have lived alongside humans more recently, it ought to be no surprise to Christians. For God has said that He created all the animals in the same week that He created man (Genesis 1, 2; Exodus 20:11), around 6,000 years ago. Encyclopædia Britannica, 15th edition, 4:416, 1992. Some have argued that the widespread unicorn myths might have been derived from stories about this animal. Note that the ‘unicorn’ referred to in the Authorized (King James) Version of the Bible (e.g. in Job 39:9–10) is not the animal of legend, but likely a (two-horned) wild ox seen in profile. See Wieland, C., The unicorn—the Bible does not refer to fantasy animals, Creation 14(2):14–15, 1992. Nowak, R.M., Walker’s Mammals of the World, 5th edition, The Johns Hopkins University Press, Baltimore and London, p. 1332, 1991. Return to text. Capstick, P.H., Death in the long grass, St. Martin’s Press, New York, p. 238, 1977. Return to text. Black rhinoceros, Sedgwick County Zoo, www.scz.org/animals/r/rhino.html, 18 May 2005. Return to text. From an evolutionary perspective, anything before human-recorded history is ‘prehistoric’. But the Bible’s historical account takes us right back to the creation of time (Genesis 1:1; 2 Timothy 1:9; Titus 1:2). Before this, only the triune God existed (John 1:1). Return to text. See Sarfati, J., The non-evolution of the horse, Creation 21(3):28–31, 1999. Return to text. Horse tales, Creation 28(1):9, 2005. Return to text. The horse’s tale, Science 309(5733):378, 2005. Return to text. Orlando, L., et al., Ancient DNA analysis reveals woolly rhino evolutionary relationships, Molecular Phylogenetics and Evolution 28:485–499, 2003. Return to text. Wieland, C., Muddy waters, Creation 23(3):26–29, 2001. Return to text. See Wieland, C., The evolution train’s a-comin’ (Sorry, a-goin’—in the wrong direction), Creation 24(2):16–19, 2002. Return to text. Robinson, T.J. et al., Interspecific hybridisation in rhinoceroses: Confirmation of a Black x White rhinoceros hybrid by karyotype, fluorescence in situ hybridisation (FISH) and microsatellite analysis, Conservation Genetics 6(1):141–145, 2005. Return to text. Batten, D., Ligers and wholphins? What next? Creation 22(3):28–33, 2000. Return to text. Assuming that Noah understood ‘clean’ and ‘unclean’ the same way that God later decreed to Moses (Leviticus 11:3–4,26; Deuteronomy 14:6), only one pair of rhinos, rather than seven specimens, was taken on board the Ark (Genesis 7:2). Return to text. Note that the rhino apparently did not reach the Bering Strait and ‘Wallace’s Line’ (see Creation 27(4):35, 2005—footnote 3) until after the end of the Ice Age—the lower sea levels during the Ice Age provided land bridges that other animals had used to move into the Americas and Australia. See Oard, M., An Ice Age caused by the Genesis Flood, ICR, California, 1990. Return to text. Rhinos, World Wildlife Fund, 18 May 2005. Return to text. However, London Zoo recently exhibited eight scantily clad men and women in the bear enclosure, saying that it ‘teaches members of the public that the human is just another primate’. See ‘Humans in zoo—by choice’, Creation 28(1):7, 2005. Return to text. Wieland, C. and Sarfati., J., Earth Day: is Christianity to blame for environment problems?, 20 March 2002. Return to text. E.g. dinosaurs. Return to text.